A press release by the new Coalition of Vancouver Neighbourhoods including in a post on Frances Bula’ s blog claims that housing growth rates are five times greater than those committed to in the Regional Growth Strategy. However, since 2011, the city has already proposed or approved sufficient new housing to accommodate 43,000 people. In just two years, this planned housing satisfies 28% of the growth the city projects being required over the next 35 years. Unfortunately, they didn’t say how they arrived at 43,000 or exactly what the number represents. As it seems rather high, I thought I’d some research. The Regional Growth Strategy Population, Dwelling Unit and Employment Projections states that in the City of Vancouver, the number of dwellings in 2006 was 264,500 while the target for 2021 is 306,700 representing an average increase of 2,813 units per year. As shown in the table above, the average net new dwellings a year for the last three years is 3,483 units, a whole 24% above the target of 2,813. As some of the demolitions may be multi-family housing, the number of net new units might even be smaller. 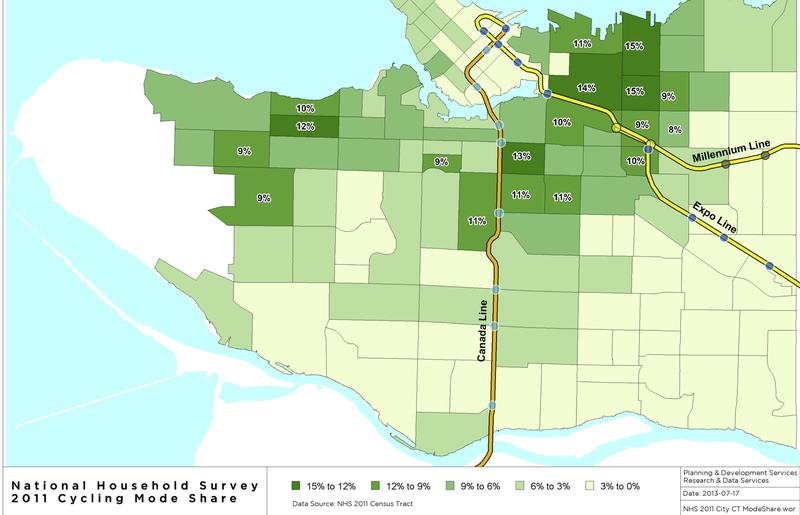 No where even close to five times as claimed by Coalition of Vancouver Neighbourhoods. Kind of too bad though. The city would become much more affordable. Urban Futures using the 2011 Census data, found that the number of dwellings increased by 11,195 between 2006 and 2011, an average of 2,239 units per year, 574 per year less than the RGS target. That would bring the amount below the target to 2,871 over those five years. Assuming these numbers are even comparable, even with being 24% over the target for 2010-2012, we would still 2,008 under the RGS target by the end of 2012. Maybe more as I’m really starting to suspect that the demolition numbers do not include the number of units in multi family housing torn down. jakking explains how they arrived at the 43,000 in the comments below. At this point, I’m still really not convinced that it is valid evidence that development of new homes is proceeding too fast. Now, since there are many neighbourhoods where little or no development is taking places, some neighbourhoods are likely experiencing more than their fair share of growth. It is only fair that low growth neighbourhoods adopt new plans so new homes accommodating people with a diversity of income levels are built across the city. Updated to correct 2010 housing starts to 4,075 and average to 3,483; added reference to jakking comments; and added Urban Futures Census. Next summer, people of all ages will be able to enjoy cycling and walking from Kits Beach to Jericho along Point Grey Road extension of the Seaside Greenway. Thousands of residents and visitors will experience the great views from parks dotting Point Grey Road. Year round, cycling commuters will take advantage of the this safe direct route from the West Side to Downtown and out to UBC. City council heard from over 130 people during five days of meetings. Councilors Carr, Deal, Louie, Meggs, Reimer, Stevenson and Tang voted for the Point Grey improvements while Affleck and Ball voted against. On the previous Monday, council unanimously approved improvements to the Burrard Cornwall intersection that will make it safer and more convenient for everyone. Council also asked Park Board to plan improvements to the Seaside Greenway paths in Kits Beach and Haddon Parks. The most contentious part of the plan is the diversion of through motor vehicle traffic off Point Grey Road between Macdonald and Alma. People walking and cycling will be able to continue straight along Point Grey between Macdonald and Alma. Drivers will still be able to access the homes and parks along Point Grey through the north south side streets. Several residents along Macdonald and other streets were concerned about increased traffic due to the Point Grey diversion. In response to the concerns, council directed staff to address livability concerns and help mitigate the impact of traffic through measures including traffic calming on residential streets. Many people on both sides of the debate agree that motor vehicle traffic is dangerous. People don’t want to cycle in it or have it near their homes. That is why improving transportation choices is so important. When projects like this encourage more people to cycle instead of driving, the city becomes safer for everyone driving, walking or cycling. Others were worried about congestion. Chances are, as with the case with Burrard Bridge and Hornby bike lanes, these issues will very likely not be as bad as some expect. In fact, more people cycling and walking due to these improvements will decrease traffic on roads throughout the community and downtown. Road space will be reclaimed to join Tatlow and Volunteer Parks together with only a bike path and sidewalks separating them. Future plans include the daylighting of Tatlow Creek. Also Point Grey Road Park will be expanded at Trutch Street. From Balsam to Trafalgar, the proposed separated bike lanes were rejected due to resident’s concerns regarding the removal of parking. Instead, the street will likely remain pretty much as it is now. While there is not much traffic on this section of Point Grey, parking is allowed too close to the driveways to allow cyclists and drivers pulling out of the driveways to see each other. Hopefully, the City will address this problem. Between Trafalgar and Macdonald, there will be a 4m wide separated bike lane on the north side of the road. A pedestrian and cyclist activated signal at Stephens and Point Grey will allow cyclists to access the new York Bikeway. From Alma to Jericho Beach, there will be separated bike lanes on the north side of Point Grey. Also approved were improvements to 3rd Ave including a bicycle pedestrian signal at Macdonald and a traffic diverter at Bayswater. Overlooked in these plans, is the need for an all ages connection from Burrard Bridge to Kits Beach and the Seaside Greenway at Yew and Cornwall. 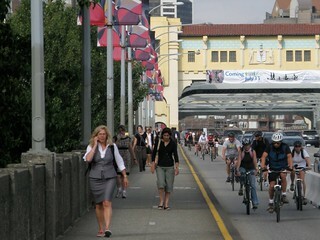 The current plan has the Seaside Greenway extending east to Yew adjacent to Cornwall in Kits Park, then heading north. It is uphill to York along Yew. It would make more sense to extent the path east to Arbutus then either have a path along Arbutus to York or find a way to include separated bike lanes along Cornwall. One possibility is acquiring space from the property owners on the south side of Cornwall. The new route along Point Grey will only require cyclists to cross one intersection between Yew and Jericho while the current route along 3rd Ave requires crossing 18. As intersections account for over half of cycling collisions and much of route is separated from traffic, the new Seaside Greenway should prove to be very safe to cycle on. The lack of intersections and hills will also make it faster. Transportation is being transformed by new realities including an aging population; mobile communications technology; the end of inexpensive energy and resources; rising health care costs due to inactivity and collisions; the need to reduce environmental impacts; and a generation of young people for whom driving is not a priority. The emergence of car and bike sharing along with mobile communications technology is changing personal mobility from a consumer product to a service. Currently, there is no Province-wide plan integrating the various initiatives, projects, services and transportation authorities including BC Ferries, the BC Transit Plan, the Cascades High-Speed Rail, the Gateway Program, the Island Corridor, BC Transit and TransLink. Projects and systems are being planned in isolation without consideration of the long-term provincial context: the Massey Tunnel, Surrey Rapid Transit, the BC Ferries Review, the Pattullo Bridge, the E & N corridor and so on. These initiatives will cost billions of dollars and there is little or no overall coordination. 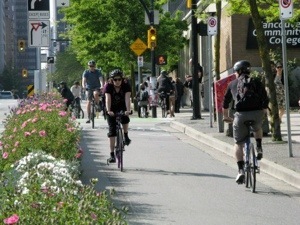 In light of the new realities, British Columbia is in need of a long-term passenger transportation plan that will provide residents and visitors with safe, convenient, affordable transportation options between cities and towns connecting to with current and planned transportation networks in neighbouring provinces and states. This plan should integrate rail, bus, ferries, airports, land use, cycling and walking into seemless combined mobility solutions. Also needed are secure funding sources that are aligned with the objectives and the goals of the plan.A coordinated plan would provide higher levels services, lower travel times at less cost to the provincial government and passengers while minimizing environmental impact, congestion and collisions. It would also help met goals of producing compact livable communities where people do not have to use personal motor vehicles. Such a plan would enable efficient use the capacity of existing and planned road and transit infrastructure. This could delay or eliminate the need for costly capacity upgrades of bridges and tunnels thus allowing capital funds to be used on other projects. This also maximizes revenues and decreases operating costs thus minimizing the subsidies required for given levels of service. Good connections to intercity ferries and rail could also improve the business case for rapid transit lines enabling their completion to be advances. It also could affect the prioritization of rapid transit investment.Most BC communities and regions including the CRD and Metro Vancouver have produced transportation plans. However, without knowing where provincial intercity transportation routes and stations will be, decisions may be make that will not be optimal. The Provincial Transit Plans outlines goals, objectives, routes and projects for regional transportation. It does not define such for inter-regional transportation. The South Coast Transportation Act does provide the opportunity for communities east to Hope and North to Squamish to join but so far, that have chosen not to. Without a provincial transportation plan, it will be more difficult to make decisions on where to put development and transportation projects. There is also a need to reserve right-of-ways, station sites, dock sites, rail yards and other space required for multi-modal hubs. With expensive land prices and pressure to develop land, right-of-ways and other land required to support transportation can easily be lost greatly increasing the cost of transportation projects by then requiring expensive tunnels or elevated structures. Even other transportation can impact future intercity transportation right-of-ways. For example, the construction of the Millennium Line and the Highway 1 widening may opportunities for high speed rail along these corridors. For many people, mobile communications is now more essential socially and economically than owning a car. With smart phones, laptops and tablets, ime spent in transit and rail can now be productive economically and socially. Transportation expert Tom Vanderbuilt has queried that it is not mobile devices that are distracting people from driving, in reality it is driving that is distracting people from mobile devices. If we don’t provide such forms of transportation, we will be less economically competitive and BC will have challenges attracting the talent required to build the economy of the future. Then there is the horrific human cost of motor vehicle collisions. Transport Canada estimates the societal cost of collisions amounts to around 3% of GDP. Collisions are also responsible for around 20% of congestion. Delays caused by collisions are typically long and random and thus have the greatest impact on travel time predictability. Reducing motor vehicle distance traveled by providing people with safer options such as rail is one of the most effective ways to reduce collisions, injuries and fatalities. Intercity travel is typically higher speed and thus better options could have a significant impact on collisions, injuries and fatalities. Our current transportation system is built around and made possible by gasoline. Gasoline has high energy content for its weight and volume, is inexpensive to store and can refuel vehicles quickly. These properties enable people to own one relatively inexpensive vehicle that can be used both for short urban trips and long trips across the province, country or continent. All these factors combine to increase the power required and thus increase the size and the cost of the batteries needed. When most trips are short urban trips, it is not cost and energy effective to drive the vehicles needed for long trips everyday. Without other options for long distance trips, given the choice between buying the very expensive electric vehicle required for long trips and a much cheaper gas powered one, many people will likely chose the gas-powered one. For longer distances, it is much more efficient to draw electric power from the grid rather than store it in batteries. As such, electric high-speed rail is an ideal compliment to lightweight battery powered urban vehicles. For trips up to 20km, electric bicycles a good solution for many people especially in hilly BC communities. They are becoming very popular in countries including the Netherland and China. In China, 30 million per year are sold compared with 23 million automobiles. 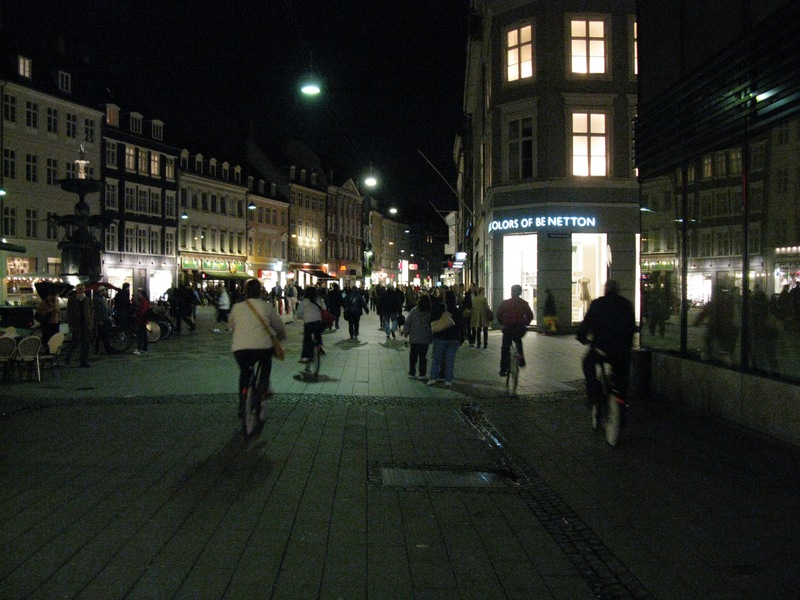 The main barrier as with regular bicycles is the lack of safe-comfortable all ages cycling infrastructure. Golf cart sized electric vehicles are very popular in retirement communities. rail is an obvious choice for longer distance travel that can be much faster and more comfortable than automobiles or buses. Higher speed passenger rail has different performance and design requirements than freight rail making track sharing less than ideal. Grade separation is typically less expensive as grades of up to 6% can be used as opposed to 3% for freight trains and less vertical clearance is required from overpasses. Long straight stretches are also needed for high-speed rail to hit maximum speed. Sophisticated automated signalling and control systems are used to prevent collisions on dedicated track reducing the need for heavy impact protection structures on the trains. This reduces operating and rolling stock costs while increasing maximum speeds. Faster travel time reduces staff and rolling stock cost per trip and increases passenger revenue as people value reduced trip times. This improves the bottom line meaning lower or no operating subsidies are required. Already, we are following behind even our immediate neighbours. Washington State has invested over $600 million in the Cascades Rail Corridor, mainly between Seattle and Portland due to indifference from the BC and Canadian Governments. Premier Reford of Alberta, is supporting high-speed rail between Calgary and Edmonton. The Washington Department of Transportation has lead the study and improvement of the Cascades Corridor. With BC Ferries experiencing financial challenges, now is the time to look at a complete rethink of its role in the transportation system. This could include transforming BC Ferries into an integrated transportation organization that is a marine transit system in addition to a marine highway system. The current mandate was reasonable back in the 1960’s but faced with the new realities going forward, this needs to be reconsidered. The BC Ferries Act review does mention improved transit to terminals but did not evaluate options to do that nor evaluate options to better integrate transit at lower cost by more optimal terminal locations.In the Metro Vancouver, the terminals require the majority of the population to cross bridges and tunnels that do not have excess capacity and are congested during large portions of the day. Connections to Naniamo, the second largest community on Vancouver and the communities between Naniamo and Victoria including Duncan, Ladysmith, Chamanis and Shanagan Lake are particularly inefficient. Naniamo is essentially due west of UBC and YVR but to access the ferries to it, travelers are required to go way north to Horseshoe Bay or way south to Tswassasen. A terminal near UBC or YVR like Bridgeport would be much more direct.The Island Corridor Review mentions ferry connections but did not evaluate options to improve those connections nor evaluate locations that might be optimal for ferry and rail connections. Welcome to my new blog. Where I can post about anything. Not just my usual cycling or transportation stuff although I expect that I won’t be able to help that. The advantage here is that I’m not posting on behalf of an organization so I can pretty much say what I want. For better or worse. Really excited about nabbing richardcampbell.org! No idea how that happened. Google Richard Campbell and you will see what I mean. There is quite a gang of us. Maybe I should buy a lottery ticket!